The fearless imagination and deft hand of one of our country's most talented playwrights are on sparkling display in Curious Theatre Company's staging of David Lindsay-Abaire's 2007 Pulitzer Prize-winning Rabbit Hole. Lindsay-Abaire, who suffused his previous hits, Fuddy Mears and Kimberly Akimbo, with amnesia and accelerated aging, here imbues the proceedings with the grieving process, all as a platform to explore his ever-quirky and deeply insightful take on the human condition. 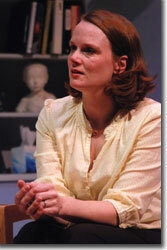 Becca (Rachel Fowler) and Howie (Erik Sandvold) recently lost their four-year old son. Their journey through the ensuing emotional jungle is fraught with pain and discomfort—not only their own, but that of their family and friends. Seasoned with occasional references to the Greeks, the play is itself a classically structured drama, with death looming off stage and the human heart beating front and center. Becca and Howie are tested in every conceivable manner—and we with them—finally arriving on a distant shore, profoundly changed yet ready to face life's continuing challenges. Nothing is overplayed: the performances are as uncluttered and transparent as Christy Montour-Larson's direction, inviting the audience's full absorption in the story. Fowler, fresh from her portrayal of Helen Keller's mother in The Miracle Worker at the Denver Center, gracefully integrates Becca's multifaceted moods and relationships with her sister, her mother, her husband, and even a stranger related to her son's death. 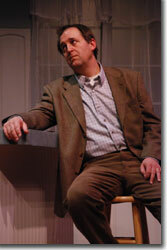 Sandvold, the 2008 Denver Post Ovation award-winner for Solo Performance, pulls Howie from his bottomless well of personalities and discovers him as adrift and as at the mercy of natural forces as his shipmate; yet, he is ever the heartbroken dad, tolerant son-in-law and brother-in-law, not withstanding an occasionally angry husband and neighbor. Jessica Robblee turns on the girlish charm stirred with street sass as Becca's wild, younger sister Izzy, who grows up fast. Kathryn Gray is delightfully dizzy as Becca and Izzy's mom, Nat. 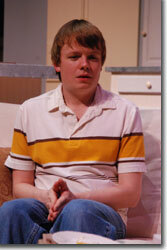 Sean Mellott as Jason, a neighboring high school senior, waltzes across this story's most precarious tightrope. It's not often we experience a thorough catharsis outside the bounds of tragedy (the boy's death precedes the action of this play), but with this drama Lindsay-Abaire succeeds where mortals rarely tread. 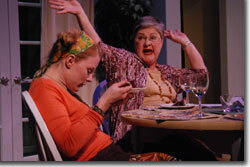 Curious Theatre Company's Rabbit Hole runs through February 14th at the Acoma Center. 303-623-0524.